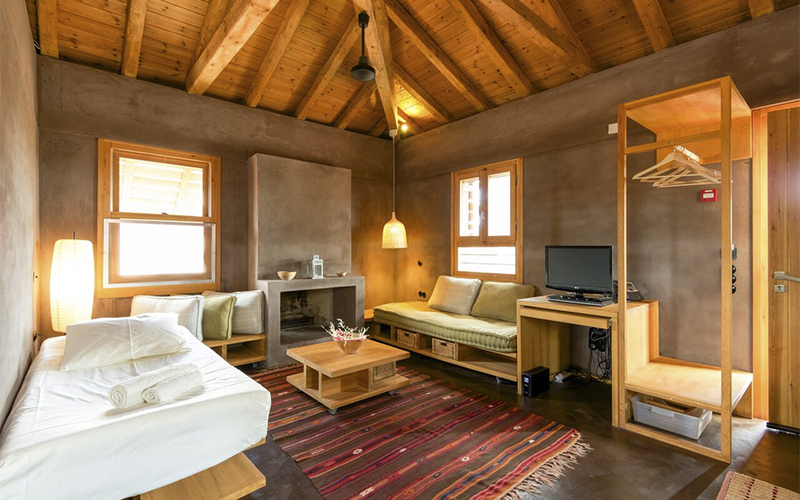 Revel in the purest of pleasures at a joyful and enlightened bio-dynamic farm and guesthouse just 2 hours from Athens. The June sky is bright with familiar constellations. They’re outshining the moon tonight, lighting the way to our well-appointed bungalow after the private wine tasting we’ve just enjoyed, barefoot, at the edge of an olive grove. Soon we’ll be fast asleep; night birds and insects create a symphonic thrum more potent than Ambien and sweet as a lullaby. 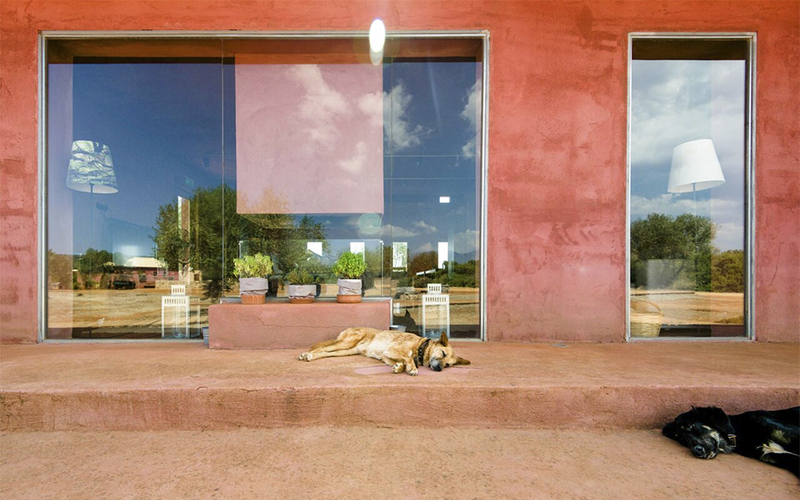 Eumelia, is part summer camp, part plush resort, a guesthouse and biodynamic farm that is the definition of ‘agro-luxury’. The name means “beautiful melody”, one that is sometimes hard to hear amid the noise of urban life. Happily, it sang out to our host, Frangiskos Karelas, himself a onetime urbanite who was raised in New York and studied, not agriculture, but international relations at Johns Hopkins before taking up a European Union position in Brussels. He made a brief visit here several years ago, just to take care of some family paperwork (his family has run the farm since the 1890s). Then he ended up letting the land change his life. Sharing the joys of living in harmony with nature, he lets the land change our lives a little, too. We pause at a pear tree; its presence here predates that of Frangiskos. Having sprouted in an ideal spot where the soil, wind and water provide for its needs, its fruit was nevertheless hard, and low in flavor. But Frangiskos left the tree where it had always been and simply grafted on a scion (a cutting) from a tree with tastier fruits. It’s the perfect metaphor: nature gives with abundance, we have only to be open to it, aware. We don’t need be constantly wrestling everything into place. Our elegant bungalow shows the same sense of harmony: in addition to every conventional comfort – the Greek-made luxury mattresses and pillows, plush cotton towels and robes – there’s the even sweeter comfort of a pure conscience. 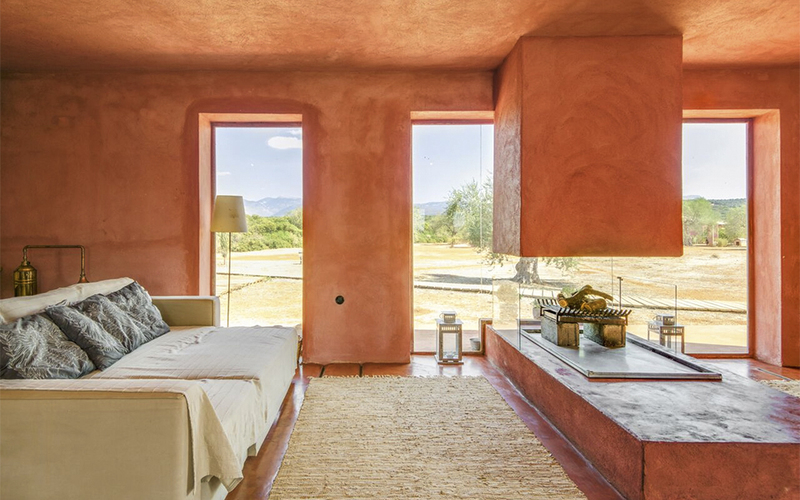 The bungalow is made of sustainable, breathable materials. The hot water raining down from the enormous shower head and the light we read by at night are gifts from the sun. We will be leaving the smallest possible footprint. Nothing will be wasted. The water that flows down the drain will be filtered through layers of stones and gravel until it is pure enough to return to the surrounding lands. In the stillness of the grove behind the bungalow is a majestic reminder of what is at stake: olive trees of character and astonishing age, some over ten centuries old, and thriving. 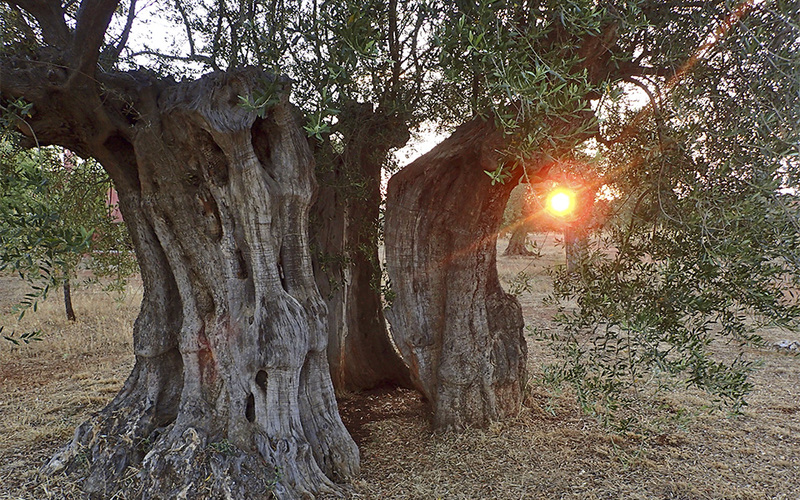 Frangiskos relates a beautiful truth: the older the tree, the more complex and rich are the olives it produces. The ancient trees inspire reverence, he says, instilling a profound sense of the privilege of being their stewards. Eumelia is the ideal meditative retreat. But it can also be as engaging as you like. The first evening of our stay we have a lively wine tasting. Marilena Karadima, Frangiskos’ wife, is a vibrant and inspiring sommelier. She has chosen five wines for us, from local organic producers. When paired with regional cheeses and cured meats they reveal themselves as the light ebbs and the stars come out. 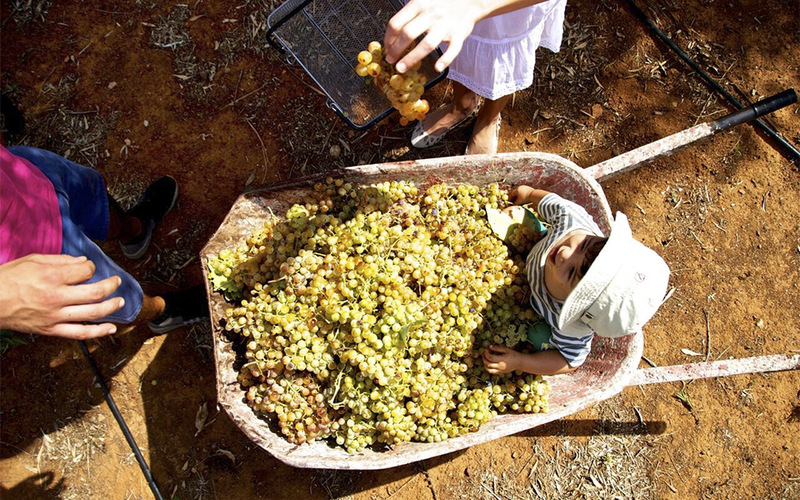 She sharpens our awareness of minerality, tannins, each wine’s body and weight. Through her pairings, we imagine fresh ways to marry our own wines and dishes at home in ways that will make them both shine. We’ve enjoyed wine, and life, a little more ever since. At a cooking workshop the next day, we make one of Greece’s best known dishes – dolmadakia (stuffed vine leaves). But these are dolmadakia with a twist, starring a surprise local ingredient: smoked trout from a local mountain spring. With Eumelia’s own vine leaves and herbs, napped with a light lemony sauce, they’re both elegant and wild, possibly the very best we’ve ever eaten. Eumelia also offers more primal satisfactions – there is no antidote for the stresses of urban life like really and truly getting your hands dirty. In September, visitors can participate in the grape harvest, then press the grapes using traditional methods (to music!). The olive harvest follows in November and December. 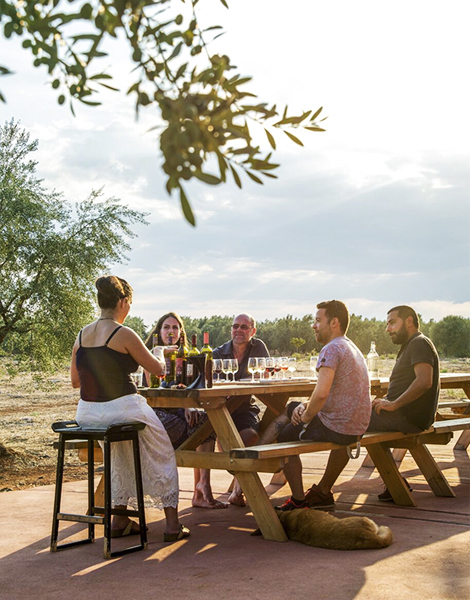 In addition to picking olives, participants learn about pressing extra virgin olive oil (it smells better than even freshly cut grass) and curing organic Kalamata olives. If you miss the hands-on experience, you can still learn more about extra virgin olive oil through tasting seminars any month of the year. The spiritual potential of interacting with nature is explored in greater depth through meditative retreats. Some of Eumelia’s central offerings are its yoga, meditation, and life coaching courses among the ancient trees which seek to take the inspiration of living in harmony with nature a step further. Perhaps of all of Eumelia’s educational offerings, the most valuable are the team workshops in environmental and sustainable living. Eumelia can be much more than a retreat, it can be a starting point for a shift in consciousness. 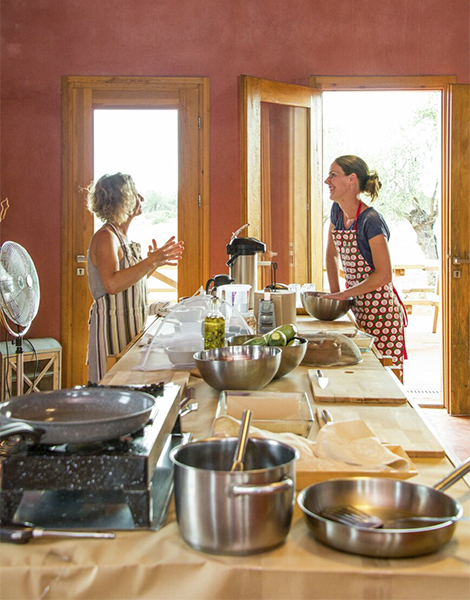 Alternative health, the benefits of organic farming methods, and self-sustainability are positive lasting lessons to take away from the Eumelia experience. These are just some of the experiences on offer – for more information on events as diverse as nature photography workshops and organic weddings under the stars visit the Eumelia website. Of course, that said we could happily loll around exploring our inner worlds from hammocks strung between trees the rest of our stay, but the attractions of the outer worlds of Laconia and Mani are just too compelling. The Taygetos and Parnonas mountain ranges are right nearby. I’ve also always wanted to explore the Diros caves, with the lake cave Glyphada, by boat, but then again who could bear to hide from such a sweet early summer sun? Monemvasia, the medieval castle town, is not an hour from here. And any one of the many rich historical and archaeological sites that are within easy reach would make a worthwhile destination. But the rugged coast and a horizon that feels like the very edge of the earth beckon. So for the last day of our stay, Frangiskos and Marilena drive us through the rough glory of Mani to Limeni. 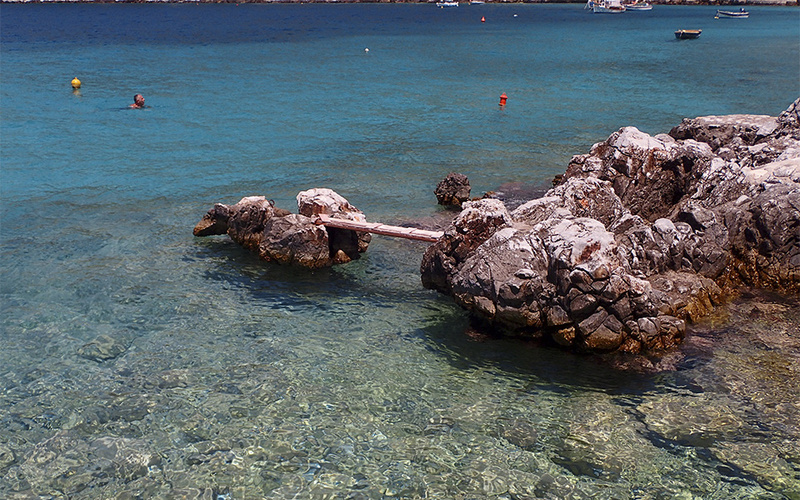 In this hidden, deep harbor Greece’s severe beauty is at its most elemental. We jump from rocks bleached white by the sun into waters the color of jade, then observe a treasured summer ritual, a lunch of lobster pasta and cool white wine, in sarongs and bathing suits still damp from the sea. If we have learned anything at all at Eumelia, it is to succumb with grace to the beauty that lies before us. 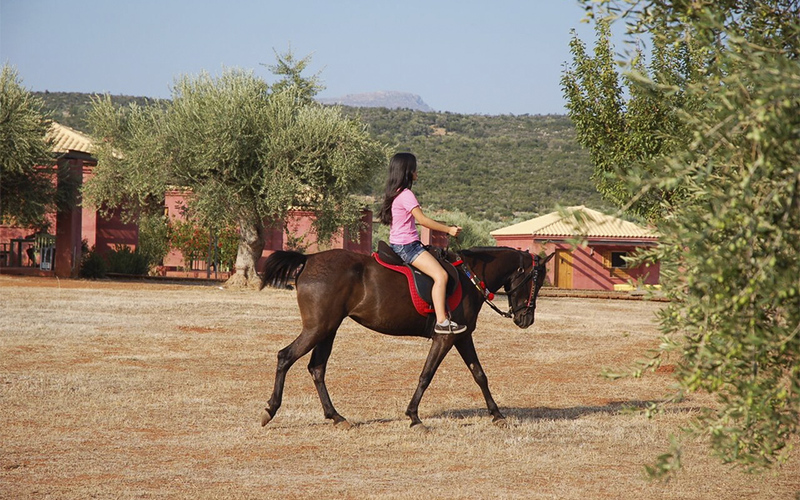 Eumelia is a family friendly experience – and that means all the family, pets included, will love it. Eumelia is in the southern Peloponnese, on the way to Gytheio. It’s a gorgeous three hour drive, beginning with the drama of the Corinth canal. We went by bus, talking the KTEL to the nearest town – Valchioti – and a taxi from there. Complete directions can be found here, or (+30) 6947 151400. For information about all activities and booking a stay, click here.